This red wine provides and intense, dark red colour. The flavour of the Cabernet Mitos cuvée partner strongly reminds of its parent, Cabernet Sauvignon. This dense, expressive red wine has a velvety flavour of fine wild berries combined with ripe tannins and a delicate touch of oak. 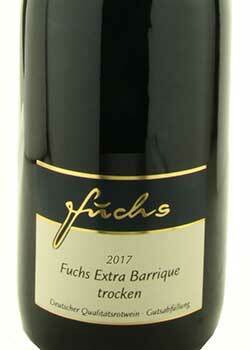 Fuchs Extra Barrique dry red wine goes well with venison, roast beef, goose or duck as well as with aromatic kinds of cheese.